1878-1880s autograph album that belonged to Flora Elizabeth Scott of Plymouth, New York. Pages signed by relatives provided the clues to her identity. 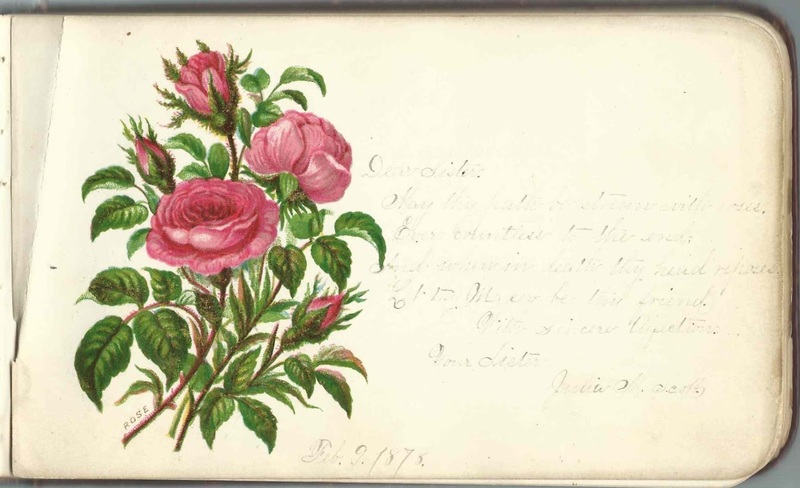 The album measures approximately 7" x 4-1/4" and contains the sentiments of 64 of Flora's relatives, friends and schoolmates. An alphabetical surname list and an alphabetical list of the signers, together with any personal information they offered, appear at the end of this post. Flora Elizabeth Scott was born October 9, 1864, the daughter of Col. Jay Monroe Scott and Clarissa Minerva (King) Scott, who were born at Plymouth, New York, and Norwich, New York respectively. 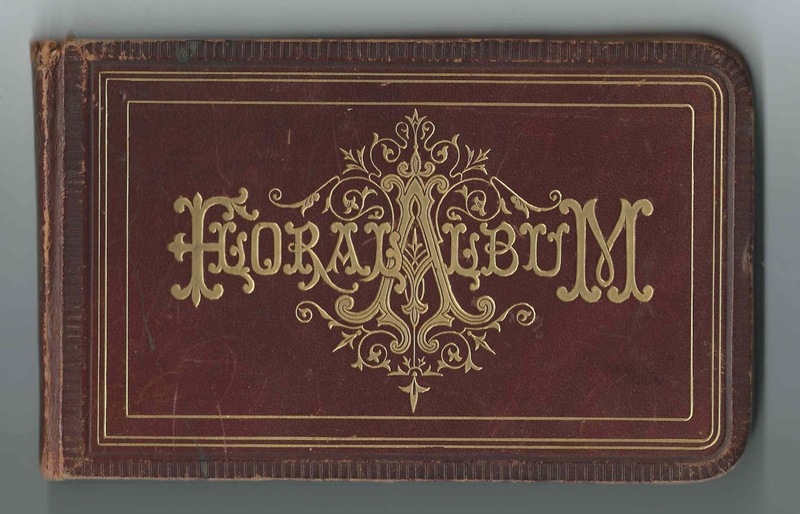 Flora's mother, Clarissa Minerva (King) Scott inscribed the first page after the title page on February 15, 1880 [though she was not the first person to inscribe a page in the album]. J. M. Scott of 113 East Randolph Street, Chicago, Illinois, inscribed a page on March 10, 1880. He was Flora's brother, Jay Monroe Scott, Jr., not her father, who had died in 1875 before she started keeping this album. Flora's sister Julia M. Scott inscribed a page on February 9, 1878. Flora's brother Charles W. Scott inscribed a page at Preston, New York, on April 21, 1878. 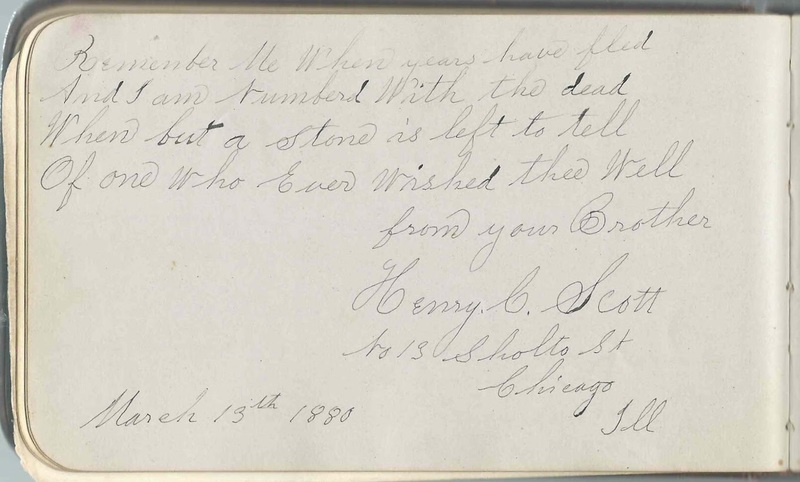 Flora's brother Henry C. Scott, then living at 13 Sholto Street in Chicago, Illinois, inscribed a page on March 13, 1880, presumably while visiting his family in New York. Many other members of the Scott, King and related families inscribed pages in the album; refer to the list of signers below. On December 31, 1889, Flora Elizabeth Scott married George E. Graff of Williamsport, Pennsylvania. Interestingly, a few of the signers in the early 1880s mentioned high school at Williamsport. It seems that Flora spent some time there or at least visiting there, if not attending school. George and Flora settled at Williamsport. I don't know if they had any children. J. Bradley Bliven, signed on May 9, 1878. John Bradley Bliven, whose wife Emma (King) Bliven inscribed the right facing page. Emma A. Bliven, signed on May 9, 1878. She was Emma A. (King) Bliven, whose husband John Bradley Bliven inscribed the left facing page. Charles Morell Dickerson of South Plymouth, New York, signed on April 21, 1878. His wife Helen Marr (Scott) Dickerson signed the succeeding page. Helen M. Dickerson of South Plymouth, New York, signed on April 21, 1878. She was Helen Marr (Scott) Dickerson, wife of Charles Morell Dickerson who signed the preceding page. Frantie E. Gale of Norwich, New York, signed on May 25, 1879. Possibly Esther deFrance Gale? Henry C. Scott of No. 13 Sholto St., Chicago, Illinois, signed on March 13, 1880; Flora's brother. 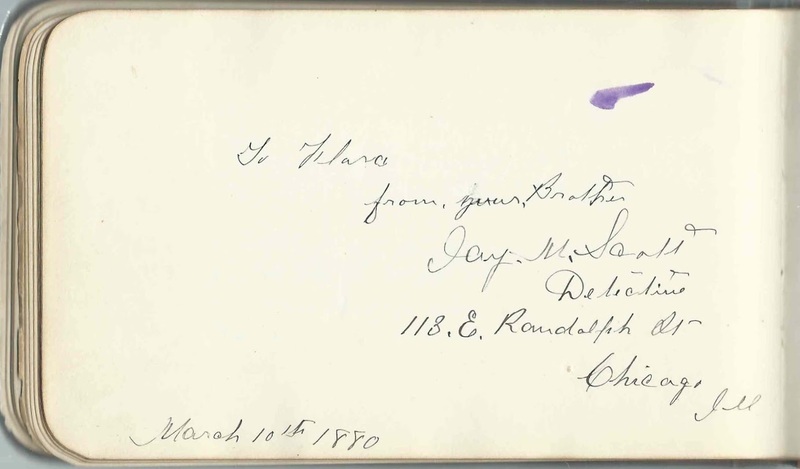 Jay M. Scott of 113 E. Randolph Street, Chicago, Illinois, signed on March 10, 1880; Flora's brother Jay M. Scott, Jr.
do you have any information on Flora's family? I own the house she and George Graff lived in in Williamsport, PA I would love to find more information! How interesting! I've heard from several other people researching their homes' previous owners. I'm contacting you separately.